Silicon pressure sensors have silicon based sensing diaphragms which have a very high elasticity and semiconductor strain gauges implanted in the silicon substrate which produce a high span sensitivity. Silicon pressure transducers have a high mV/V output signal, high overpressure and very good non-linearity, hysteresis and repeatability measurement precision. 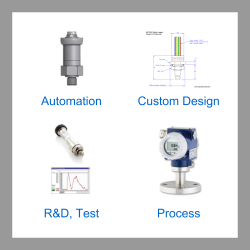 Pressure transducers & transmitters with silicon strain gauge sensing diaphragms which have output signals with good linearity, hysteresis and short term repeatability. Semiconductor pressure sensors also have high overpressure ratings and sensitivity due to the high gauge factors of the semiconductor strain gauges. Choose a silicon pressure sensor from the list below to view product specification details and request a price quotation. PD33X Digital Differential Pressure Sensor- High precision differential pressure transducer with accuracy of 0.1% full scale. Available with RS485, USB or RS232 for connecting to a computer. PD39X High Differential Pressure Transmitter- High pressure differential sensor with high over-pressure in scaleable differential ranges from 3 bar up to 300 bar differential. Pressure sensors that utilise silicon sensing elements offer many advantages over other pressure sensing technologies, they are small, lightweight, highly repeatable, stable over time, dynamically responsive and very sensitive to variations in pressure. The base diaphragm material is typically ‘n’ type mono-crystalline layer Silicon which is 100 % elastic to its breaking point and therefore is a perfect material for use as a sensing diaphragm. The strain gauges which are the key elements for converting pressure into an electrical signal are created by ion implantation of masked areas of the silicon in to create tiny ‘p’ type regions at strategic points on the diaphragm surface. When a reverse bias voltage is applied between the ‘n’ type substrate and ‘p’ type regions the ‘p’ type regions become electrical isolated and due to the relative increased conductivity of the ‘p’ type region they exhibit resistive characteristics and when pressure is applied the ‘p’ type regions behave as strain gauges. Since the strain gauges are chemically changed areas of a uniform piece of material they will deform almost perfectly with the stresses of the diaphragm without lag or separation and thus the repeatability of measured pressure points is very good over many pressure cycles. The combination of a high elasticity material and near perfectly bonded and integrated strain gauges produces a structure with very little hysteresis ensuring that pressure readings are precise regardless of the direction of changing pressure. The p type region or semiconductor strain gauge is behaves in a similar way to more conventional foil strain gauges with a change in resistance when the gauges are stretched or squeezed, however there is an added semiconductor property which combines with the resistive variation to increase the sensitivity or gauge factor of the Silicon strain gauge. Thus high levels of voltage drop can be achieved across semiconductor strain gauges for a given pressure change which allows users to make better use of analogue to digital resolution and improve signal to noise ratios. Silicon piezo-resistive elements are manufactured in the same way that miniature silicon chips are that are used in micro-electronics. The combination of chemical etching micro-machining, doping and masking techniques to create mechanical structures with micro-electronic components enables the productions of very small sensing elements. This in turn helps engineers to design smaller pressure sensors since the sensing diaphragm for other technologies is often the limiting factor controlling the diameter of the final design. The small size and low weight of silicon sensing elements make them less susceptible to acceleration. Therefore these sensors are often used in aplications which have high levels of ‘G’, shock or vibration. Semiconductor strain gauges are not glued, printed or electro-plated to the surface to the sensing diaphragm. And instead are a chemically changed part of the same material. Over time strain gauge bonds can deteriorate or change with pressure and temperature cycling causing instabilities in the sensor performance. Semiconductor strain gauges have no bonds and therefore are extremely stable in comparison. The higher gauge factors of semiconductor strain gauges compared to other types of strain gauge make it possible to use stiffer diaphragms for a given pressure range to allow a high overpressure rating to be specified without compromising too much sensitivity. The high elasticity of Silicon also makes it possible to strain Silicon further than other less elastic diaphragm materials with virtually no resulting stress. Due to high sensitivity of semiconductor strain gauges the thickness to cross-sectional area is relatively high for a sensing diaphragm plus the miniature size results in a very high natural frequency in the order of 10 – 100 kHz. This combined with the elasticity and atomically bonded strain gauges makes Silicon strain gauge diaphragms highly responsive to rapid changes in pressure. Send us your enquiry for Silicon Pressure Sensors to get assistance with this product type.